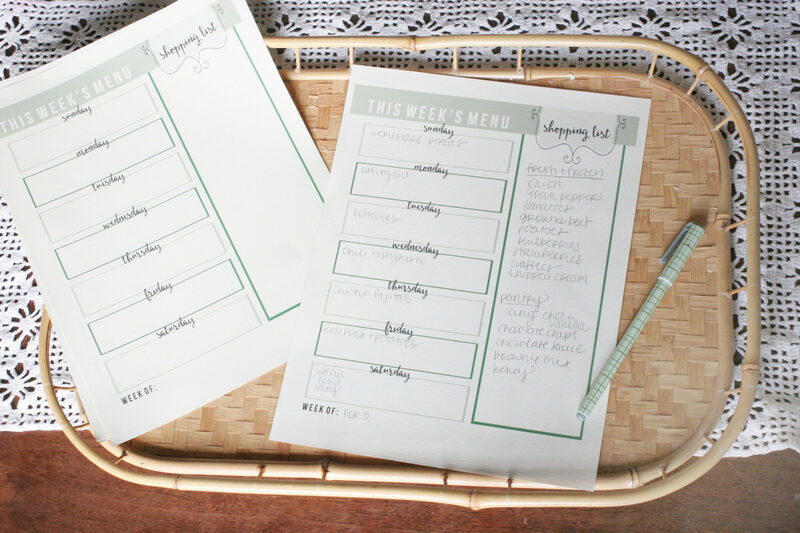 How do you plan the weekly menu in your home? I’ve tried several methods and my favorite is a meal plan and grocery list in one. Now, you can grab a copy of my menu planning printable for your own use. 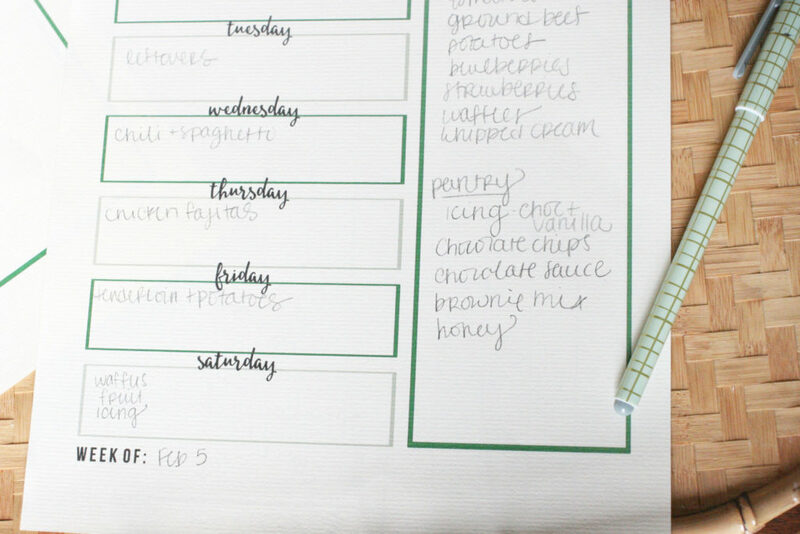 This is a simple menu planning printable. I have found that I don’t like a meal planner with a lot of detail. For example, planners that include a spot for breakfast, lunch, dinner, and snacks each day. I’ve used those planners in the past, but have found that it gets redundant and complicated. Usually, our lunch is leftovers from dinner the night before. Similarly, we may eat the same 1 or 2 breakfasts all week. Is that you, too? If so, then I think you will like this menu planning printable. If we do need more breakfast or lunch items, I just jot them down under the shopping list — rather than specifying a day of the week to eat those foods. Now, if I don’t create my shopping list as I make the menu — you can guarantee there will be missing items when it’s time to cook. I create the menu, then fill out the shopping list. To keep the actual grocery shopping simple, make the list in the order those items will be found at the grocery store. Again, without getting overly detailed and complicated. Typically, I break the list into simple categories such as fresh & frozen, pantry, dairy, etc. Print out a stack of menu planning sheets and stick them with your recipes. That way, you don’t need to print a new copy each week. Plus, you’ll have recipe inspiration right alongside the menu plan. What is your favorite meal planning tip? Another great printable! I use a notebook to keep my menu on one side and shopping list on the other side. When I do a pantry shop I will add that to one page first then menu, shopping list. 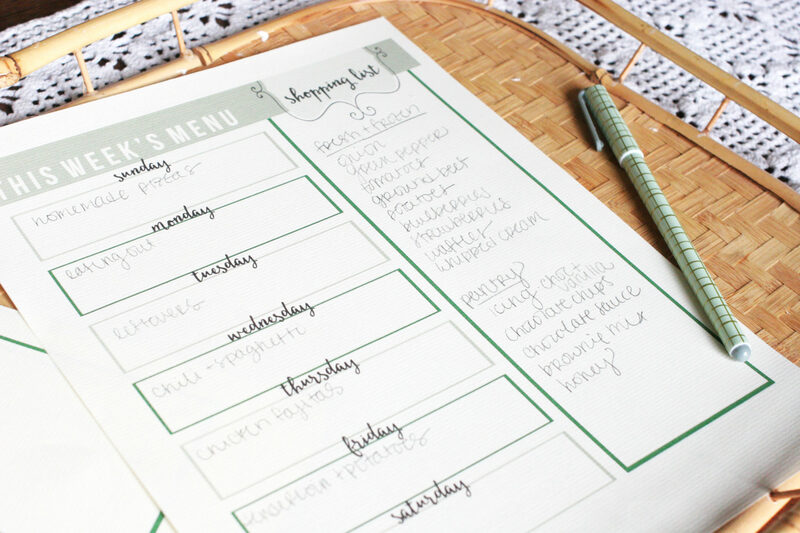 Wow this menu planner printable looks really good, it is perfect to maintain weekly menu. I use notebook to manage my menu and shopping list which is actually a reminder for me! Thanks for sharing. Really great printable.